I approached Glenda Mathes devotional Discovering Delight: 31 Meditations on Loving God’s Law (henceforth Discovering Delight) with mixed feelings and, to be honest, I left feeling about the same. Mathes' goal is to walk her readers through the 119th Psalm in the form of daily devotional readings. Futher, Mathes desires to shows how the concepts of “delight” and “Law” in the Bible aren't as opposed to one another as Christians often believe they are. While I do believe that Mathes devotions are helpful and Biblical, most of the concerns I held in approaching the book were not eased as I read through it. More on this latter. Mathes explains in the preface that Christians are often intimidated by the concept of “the Law” and often never associate such a term with “delight.” She then goes on to explain that one of the central passages in the Bible for both the concepts of “Law” and “delight” (Psalm 119) doesn’t pit these two words against each other but rather marries them. With this information in hand, Mathes sets out to take her readers on a 31 day devotional through this long but powerful passage of scripture. Mathes divides Psalm 119 according to its literary format; Psalm 119 is an acrostic poem which means that each section emphasis a different letter of the Hebrew alphabet. There are 22 letters in the Hebrew alphabet which means that there are 22 sections to Psalm 119. The way Mathes divides the book is by spending 22 days of the devotional going through Psalm 119 while bookending those 22 days with 9 days of complimentary devotions. Chapters 1 - 5 focus on other psalms that highlight delight in God’s law (1, 19, 37, 40, 112). Chapters 6 - 27 are the chapters on the 22 sections of Psalm 119. And chapters 28 - 31 look at two passages from the prophets (Isaiah 58, Jeremiah 15) and two passages from the New Testament (Romans 7, Revelation 19) that also highlight delight in God’s law. Each chapter follows a short and simple outline. First, there is an assigned scripture reading from which the devotional writing will draw. Second, Mathes opens the devotion with the problem she believes the scripture seems to be highlighting; she often does this with the use of general and relatable circumstances and stories. Mathes then shows how, within the same scripture, such a problem is overcome. Here Mathes might back up this scriptural solution by another anecdote or even research findings from another field of study. Finally, each section concludes with remarks of summary that show how God’s law (displayed in the scripture reading) and our delight (also displayed in the scripture reading) are not at odds but rather complimentary. I agree with Glenda Mathes in her estimation that many Christians have a misunderstanding about the relation between God’s Law and His grace. However, my concern is that Mathes may too hold this same misunderstanding. Among my apprehensions as I approached this book was a fear that Mathes' study of delight in God’s Law might be overly individualistic. Further, I feared that this devotional might simply offer a spiritualized application of Psalm 119 where the scriptures are easily molded to address the psyche of Americans in the 21st century. Unfortunately, both of these fears were confirmed in nearly every chapter of this book. 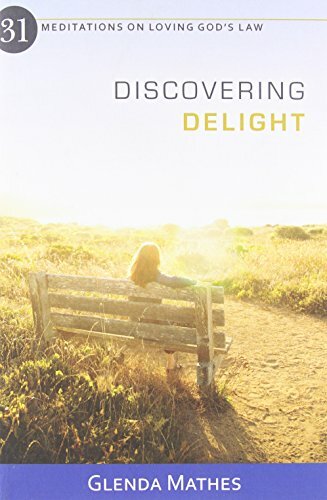 While Discovering Delight certainly does shine light on a big issue in American Christianity (disdain for God’s law) and offers a solid and Biblical devotion for individuals, I feel that it falls short in accomplishing the goal of its title. Those who read the book will discover a lot to delight in. However, with the truncated view of God’s law set forth, readers will likely find delight in the standard individualistic “Law/Gospel” presentation they are familiar with in their Presbyterian or reformed baptist churches. For those who hold theological convictions similar to Mathes, I can readily recommend this devotion to you. However, for those, like myself, who appreciate a more social and corporate application of God's law, this devotion will likely leave you wanting more.